There are many contributing factors that help explain why boys don’t read as much as girls. The structure of the school day, the chemical differences between the sexes, the books themselves, the lack of male role models, the overwhelming majority of women who serve as gatekeepers (teachers, librarians, editors, bloggers, reviewers), and so on. I’ve wrestled with this issue a lot lately. Numerous times I’ve attempted to address it, but always ended up unhappy with my tone of complaint. I can do negativity pretty well and far too effortlessly. I wanted to do something positive, something constructive, even if it was small and quite probably useless. 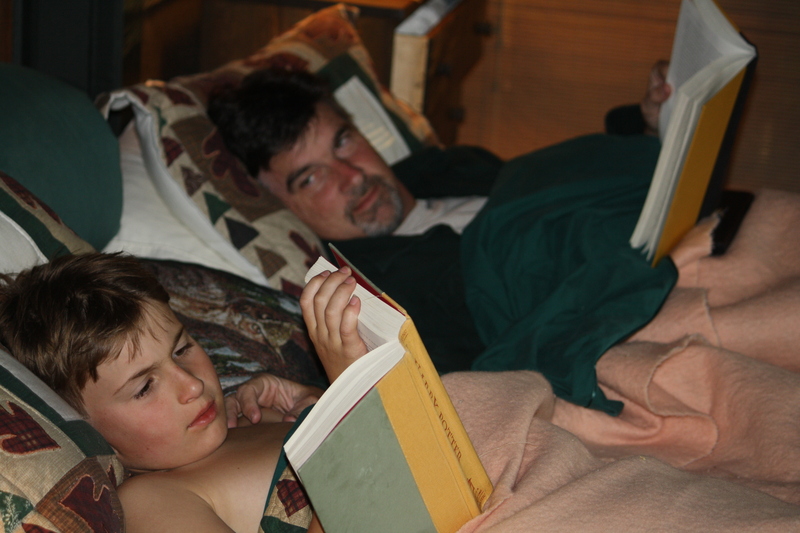 Thanks in part to an offhand comment made to me by author Lewis Buzbee (a guy who routinely imparts wisdom in casual asides), I’ve reached the conclusion that one of the most powerful, positive factors to encourage and inspire boys to read is, very simply, to see their fathers read. Look, there’s dad sitting down with a book. Any book. Fathers don’t just chop down trees, fix door jambs, and watch football. We read, too. It’s a valid male activity, like burping. Think of the power of that simple image. There’s Dad with a book in his lap. I recently acquired the domain name, fathersread.com. The site is not up and running yet, but I’m working on it. Kind of. Slowly. Here’s where you come in. I need photos. Pictures of men with books. It could be any photo, and the wider the variety the better. Fathers with children, fathers alone. A shot with humor in it . . . or not. A shot where the book cover is important — or not at all. Really, what I’m asking for is photos. That’s all. We’ll see where that brings us. Please submit your photos via email to: Jamespreller@aol.com with the subject heading, FATHERS READ. Thank you. I can’t do this without your help. If you can pass this request along to others, I’d appreciate it. In the meantime, here’s an unremarkable shot from a summer vacation, just a couple of guys lounging around, doing what guys do. * Unchartered Territory by Kristy Valenti, on boys and comics. * Boys and Literacy by Elizabeth Knowles and Martha Smith. * Connecting Boys with Books 2 by Michael Sullivan.